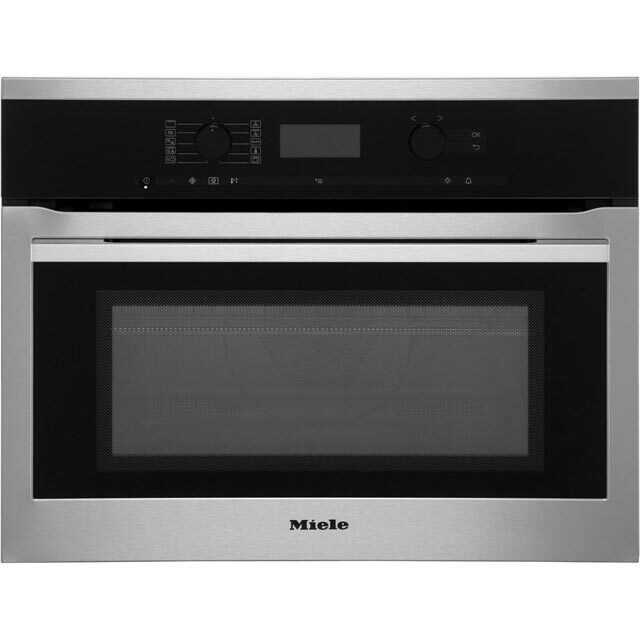 Effortlessly prepare your favourite recipes with this built-in microwave from Miele. It has a 43 litre capacity, which makes it an ideal choice for medium-sized households. Its 1000 Watt power output means you won’t have long to wait before dining on your delicious dishes. The automatic cooking programmes are a great helping hand at mealtimes, as they automatically set the perfect time and temperature – taking the hard work out of your meal preparation. Unlike standard ovens, this model’s temperature is accurate to within 1 degree, so you’ll be able to cook with total precision. This model has been tested for the equivalent of 20 years’ use, so you know it’s built to last. Want to make sure this combination microwave will fit in your kitchen? Check out our handy measurement guide video. We’ll show you everything you need to know about measuring up in just a few simple steps, so your new appliance will fit like a glove. * H6300BM_CS was at the higher price between 21/01/2019 and 10/04/2019.